India wrapped up the six-match ODI series in style after they thumped South Africa by 74 runs in Port Elizabeth. They sealed a historic series win after the hosts could only manage 204 in reply to India’s 274 to hand them a 73 runs victory. Riding on the back of Rohit Sharma’s century, the Indian bowlers turned up once again in the series to bowl the Proteas out well short of their target. 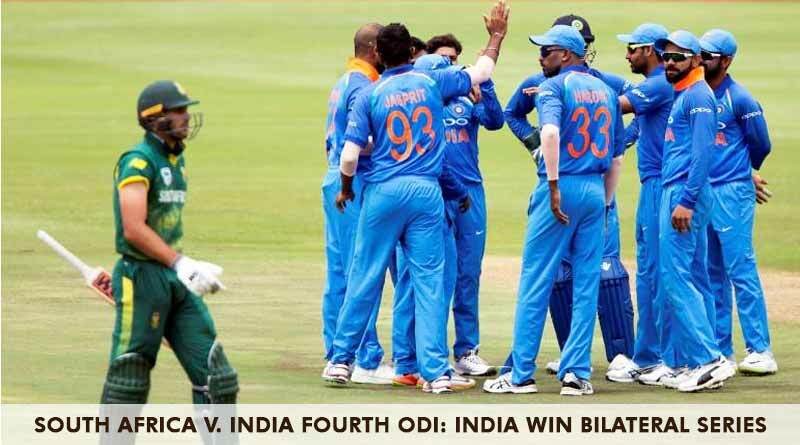 Coming off the back of a defeat, India upped their game in the fourth match of the series. After being sent in to bat by South Africa, India struggled in the opening overs of the match with Morkel and Rabada bowling a fiery spell to peg the Indians back. Opener Sharma struggled especially to get going as he defended ball after ball to find himself off just a run of 16 balls. His counterpart Dhawan though continued his fine run on the tour as he took the load on himself with Sharma not able to keep the scoreboard ticking. He maintained a good run rate for India with fine counterattacking cricket which saw him hit a slew of boundaries as he raced of to 34 of just 23 before Rabada nabbed him up. With captain Kohli at the crease, Sharma finally opened his arms as he took command of the Indian innings. The two put up a good partnership of 105 to set a strong platform for the middle order to capitalise on. The burden on Sharma’s shoulders grew immensely after he was responsible for the run outs of Rahane and Kohli. He however finally came good this series as he went on to score a well deserved 115 to take India to a respectable total of 274 from their 50 overs. Knowing that they had to win at any cost to keep their hopes alive in the series, South Africa started off well. A half-century opening stand was brought to an end by Bumrah and this resulted in a mini-collapse for the Africans. Pandya played a crucial role, taking the wickets of Duminy and the dangerous AB de Villiers. Amla’s resistance came to an end after he was run out for 73 and it was only a matter of time before the Indian spin unit ran through the hosts batting line-up to wrap the match for India.